Over the weekend, the Twitter account @Amazing_Maps ran a simple test involving each of the 50 states and autocomplete. 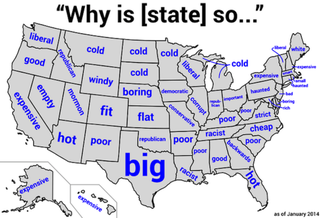 They simply queried the search engine: "Why is [X state] so…" and recorded the top autocomplete suggestion on a map yielding the biggest stereotypes from each state. While some of the outcomes are obvious—duh, Texas—some are pretty surprising (who knew Pennsylvania was so spooky? ).